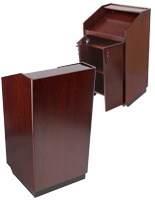 This Pulpit, Such as Furniture Presentation Stand, or Church Lectern has a Cabinet & a Draw. Ships Same day When Ordered Before 1pm, Order Now! 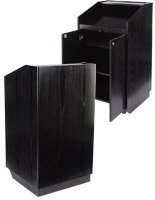 This pulpit is simple in design, yet elegant due to details & craftsmanship. 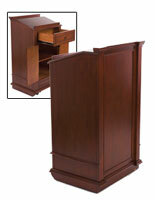 Our pulpit has an accommodating sized cabinet to hold menus, or sermon bulletins, or text books. 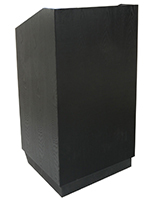 Our pulpit is constructed of 1" MDF for a strong, sturdy & stain resistant podium. 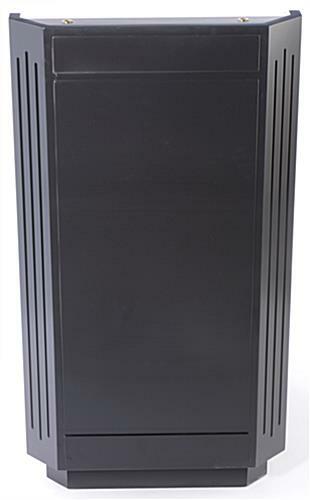 Our pulpit, such as church furniture, or black podium has 2 casters for a simple single person tilt-n-roll movability. This pulpit, such as church furniture, or presentation stand has a shelf in the middle that can be removed to have up to 14" of space above the cabinet, & underneath the drawer. The large reading surface on this black teachers podium has plenty of room for a 3 ring binder, a notebook & even a laptop. There is also a 1-1/2" lip on the reading surface to ensure your presenting supplies don't slip off. 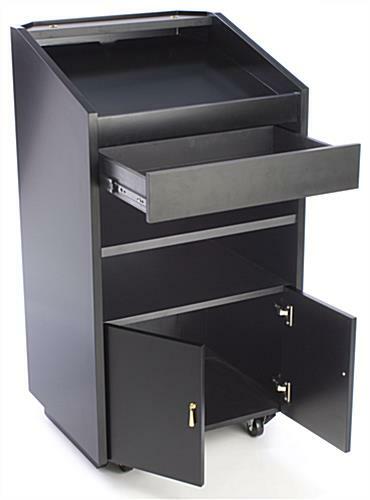 This church pulpit, such as restaurant hostess stand, or teachers podium has cable ports throughout, from top to bottom, so you can run a power cable to your laptop and not leave the wires exposed. 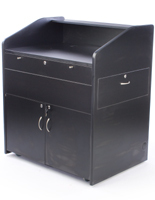 The top surface also has 2 port holes for possibly a microphone to be added and easily attached and still keep your podium looking neat and organized. 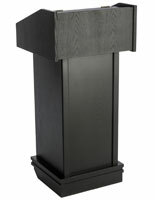 25.5" x 47.0" x 23.0"
23.5" x 14.5" x 21.5"
21.4" x 3.0" x 5.6"
The Podium is very nice in quality and construction however there are some design flaws. 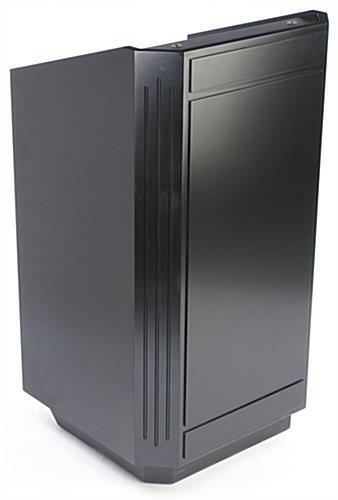 #1: having the casters only on one side makes for difficulty in moving this podium daily, you tilt the podium to the side with doors and shelves and this does not work well they swing open. 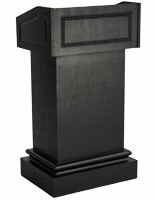 #2: This podium is kind of heavy to be tilting and maneuvering especially with a petite hostess; this will get banged up because of how heavy, and the distance we must move it daily. 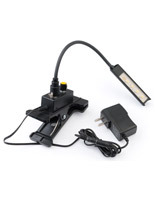 there should be 4 locking casters for ease in moving, this would make this product much better for mobile use. Joseph, we appreciate your feedback tremendously. This kind of insight helps us to continue to improve on our designs with a real-view perspective. As such, we have passed on your information to our product designers for review. We are sorry to hear that you are not 100% satisfied and we would like the chance to turn your experience around. A customer care specialist will be reaching out to see if there is anything we can do to help. Thank you again for letting us know your thoughts.